Under certain conditions, manually operated valves can be difficult to open and close. The valve may stick, freeze, or be used so rarely that its internal parts become fused. 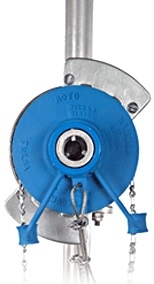 In addition, large valves are often difficult to operate when using a standard chainwheel. In answer to these problems, Roto Hammer offers the M Series Hammer Blow Impact Actuator. The Hammer Blow mimics the motion of a hammer striking an anvil and delivers a quick, measured blow that will free up a sticky valve without damaging its internal or external parts. Direct-mount models are furnished with an adapter plate that replaces the existing handwheel. This plate can be supplied blank or machined to fit the valve. If fitted, dimensional information is required. When ordering, provide diameter of existing handwheel, dimensional information (for direct mount option only) and length of chain required.